And Autoimmunity reared back its ugly head… | You can't count spoons when you're young. You can't count spoons when you're young. Times in the life of a young lady with fibromyalgia. Since being diagnosed with IBD I’ve been doing my research. I actually didn’t know that it was considered an autoimmune disease before diagnosis, but G Almighty does that make sense. I’ve been checked for some autoimmune disorders before and my new GP was concerned that it was a cause of things. I caught Hand Foot and Mouth disease. 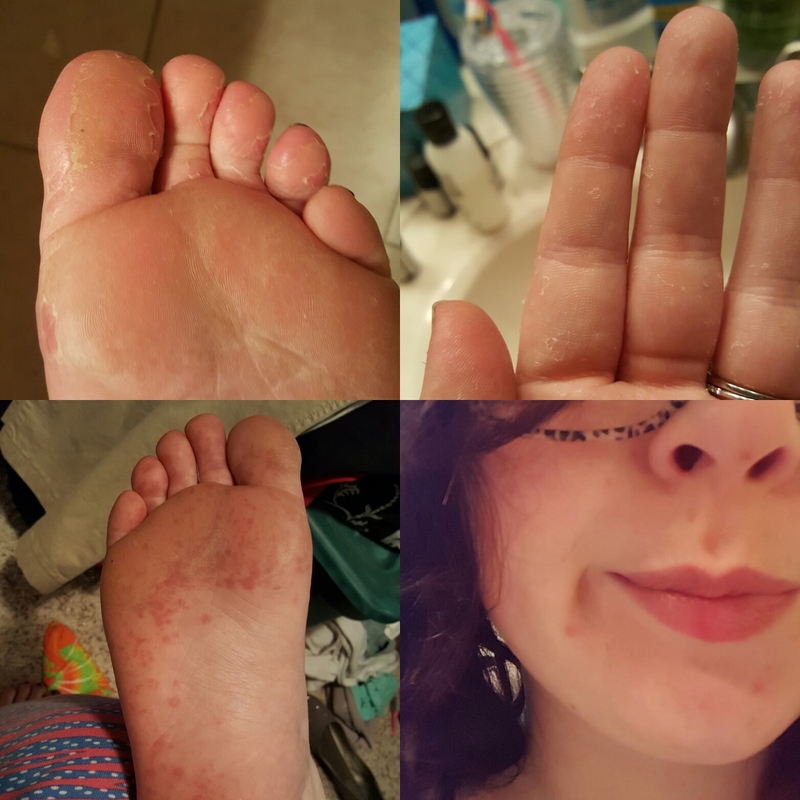 The bottom 2 are from when it started (I know you barely see it on my face, but I couldn’t bare to show my hands) and the top 2 pictures are the current healing process about 2 weeks later. For a period of time I couldn’t bare to walk or use my hands for much else other than using my phone. I was in so much pain that I was in tears and almost ended up going to the ER because just walking to the restroom was near impossible. I missed a whole week of work. It seems like my immune system just kind of picks and chooses when it works well. Although, overall, it seems to have gotten worse (along with my IBD) in the last year. Even getting out of a high stress environment hasn’t helped a whole lot. Humira, fighting my chemistry and waiting. kahlan222 on When can I say no?